This machine does it all! Print, Scan, Copy--color or black and white--pictures or text! 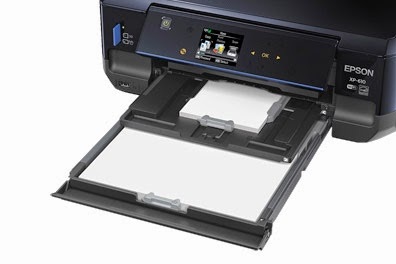 Plus the XP-610 features Epson Connect, for easy wireless printing from a tablet, smartphone or computer from literally anywhere in the world! It is slim and sleek and super easy to set up. It took me less than 20 minutes from the time I opened the box to the time I held the first picture in my hand and I'm not technically inclined, so that's saying something! It's way smaller than our former all-in-one, but has a ton of features including auto 2-sided printing, a dedicated photo tray, CD/DVD printing, built-in cards slots for PC-free printing, and much more. I was super impressed with the quality of the photos! I love the borderless look and the clarity of the images is fantastic! The printer also features Auto Photo Correction and red-eye removal, which saves you photo editing time! The 4X6 pictures take about 20 seconds to print and are immediately ready for handling...no waiting for them to dry for risk of smudging them! 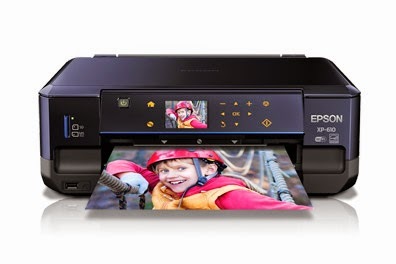 Another awesome feature is the capability for wireless printing and scanning and use of Epson Connect which allows you to easily print from iPad®, iPhone®, tablets and smartphones. Something else I loved about this printer was that it uses individual ink cartridges so you only have to replace the color you need! This saves me money and creates less waste. If you have a photography loving dad, this would make a wonderful Father's Day gift this year! ABCD Diaries gives the Expression Premium XP-610 Small-in-One an A+!